The trumpet and cornet illustrations all feature the flattened bottom valve caps that were introduced in the late 1940s. This design change occurred circa serial number 21000, which is in the same range of the first known Contempora models. The “new” Contempora trumpet is featured, but the cornet is not mentioned. In fact, the only other instrument in the catalog to explicitly mention the “Contempora” name is the bass trombone, although the catalog illustration still shows an “F.A. Reynolds” engraving style. All other instruments were simply referred to as “Reynolds” models. As such, this catalog is probably from the fall of 1949, a few months after the claimed “first use” of the Contempora trademark. 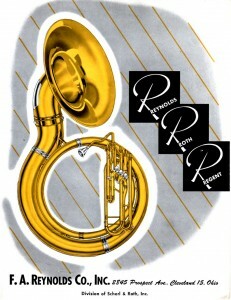 The primary instrument lines are Reynolds, Roth and Regent, as illustrated on the cover art at right, though the latter is relegated to the back cover and only the Regent trumpet, cornet, trombone and clarinet are listed from the full line of instruments that was previously documented. Note also that the Contempora designation was treated as a sub-brand of the Reynolds line, e.g. “Reynolds Contempora”. This is most likely why early Contempora models have “Reynolds” engraved across the bell flare, in addition to the familiar “retro” Contempora script.